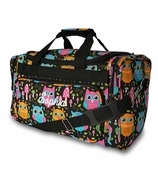 Woman's weekender duffle. 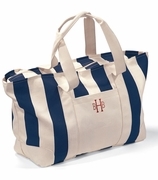 Partner with this classic monogram duffel bag for overnight stays. Easy care in an olive colored nylon fabric with saddle brown faux leather trim on the corners and handles. Lined with inside wall pocket and zipper closure. 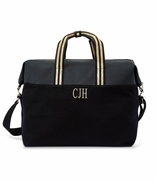 Treat yourself to this timeless fashion accessory and add your personal monogram for an upscale appearance.